Far Cry 5 is a beast. A combination of enthusiasm for the World Cup, an accompanying free mode from Electronic Arts and widespread in-store promotions has seen FIFA's sales rise by 21 per cent week-on-week, lifting it four places to No.1. More recent hits are still faring well in stores, with Detroit: Become Human holding on to No.2 despite a 46 per cent drop in sales - which is to be expected in a game's second week on shelves. Far Cry 5 actually saw a boost this week, up three places to No.3 thanks to a 36 per cent lift in sales, while God of War only suffered a 19 per cent sales dip and climbs one place to No.4. 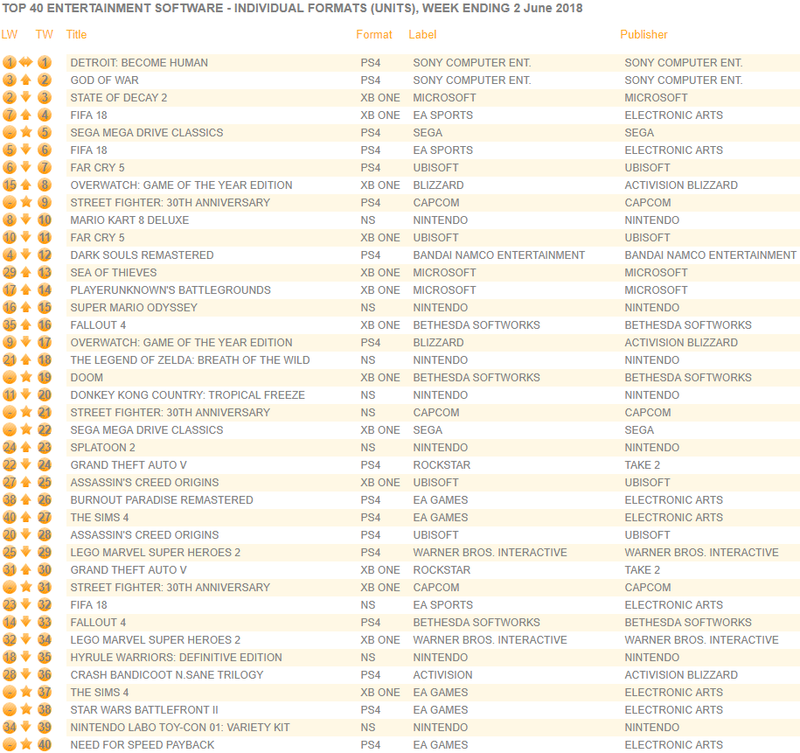 Sega Mega Drive Classics is the highest new entry at No.5, followed by Street Fighter: 30th Anniversary Collection following close behind at No.6. Very close behind, in fact - Sega's compilation only outsold Capcom's by around 600 units. Proof, as if it were needed, that nostalgia is still a decent sales driver. 46% drop for Detroit, that's pretty solid for that type of game. And only 19% frop for God of War, which was up 5% the week before. That seems like a steep drop for State of Decay 2 in a slow week. Can't really fight against FIFA at a discounted priced. That’s a great hold for Detroit! FIFA doing its thing at £20 (or less) on every system going. God of War with its leggy-legs. You should tell Nintendo to stop wasting their money on TV advertising now then. Yup. Same with Dark Souls. Its 2018 and GTA V still sells more than some new games... What is this magic? Regarding Detroit, a hold like that is going to disrupt the narrative pushed last week. Nice to see such a story-orientated game staying afloat. ~11.3K this week for Detroit. It should be over 50K in UK including digital sales. Getting close to 250k on the UK alone is damn great! Surprised to see SoT climbing that much. Seems content patches for this title can keep it in the charts for quite a while. Also labomba. it was a cool idea I think they miscalculated how much people were willing to pay for "cardboard" (in reality its a game with costs to produce like any other so just a perception thing). So SoD2 drop was between 46% and 65%? SoT is since the begining bundled. It replaced Forza Horizon 3 really. So expect it to go up and down really in combination of DLC and bundles. How did you figure that! Has the individual chart been released? That's a pretty good hold for Detroit. God of War continues with phenomenal legs as well. It's amazing to see how Ubisoft games are able to sell this generation. It's a role model for games being sp and mp and how to make money off these games. I guess everyone wants to copy them with their approach. The hold Detroit has on the PAL chart is hilarious considering the pre emptive bravery last week. QD deserves the success game is so good we want this genre to stay alive. Well the game not only reviewed horribly but it's also expensive. Afaik the MSRP was 40€. Similar games like The Observer, Outlast 2 or Get Even were 30€. Detroit held quite well. Legs should benefit from the light schedule. With digital, 300K+ easy too. Well the game not only reviewed horribly but it's also expensive. Afaik the MSRP was 40€. it seemed to have some hype in the period before release because the original trailers were so good. 240k for God of War! Whew. GoW actually went up on the value chart, that’s weird. World Cup round the corner, but I think EA are releasing a WC edition? not sure. Nice Detroit!!! Game is amazing and deserves even more success. Streetfighter sold more on switch than xbox with a £10 tax as well. World Cup round the corner, but I think EA are releasing a WC edition? There are two big exclusives competing for money spent on PS4 games. It's not all that surprising. While the drop is great and extremely promising, it's too early to make any proclamations of legs. Lets see how well it holds over the next few weeks, especially since there won't be a lot of new games out to take the spot light. Nice to see Detroit doing well here.